After a 27-10 loss in the Meadowlands to the New York Jets the week before, the Miami Dolphins arrived at Veterans Stadium in Philadelphia on November 14th, 1993 with a record of 6-2. Miami's head coach Don Shula arrived tied with former Chicago Bears' head coach George Halas with 324 career victories, the most in the history of the NFL. Shula needed just one win to become the winningest coach in league history and the Dolphins were six-point favorites over a 4-4 Eagles team. Miami's 6-2 start came as a surprise to many as the Dolphins had lost starting quarterback and perennial All-Pro Dan Marino to a foot injury earlier in the season. With Scott Mitchell at the helm, the Miami Dolphins were 2-1 and remained atop the AFC East. On that Sunday afternoon of November 14th, 1993 however, the Dolphins would find a way to top the Eagles late without the services of Mitchell. Miami jumped to a 6-0 lead on a touchdown pass from Mitchell to running back Terry Kirby in the first quarter. Running back Mark Higgs would add a short rushing touchdown for the Dolphins later in the first half, but a pair of touchdown passes from Ken O'Brien to Calvin Williams had Philadelphia ahead at the break 14-13. With Miami trailing in the second half, Pete Stoyanonvich's 46-yard field goal in the third quarter put the Dolphins ahead 16-14. Clinching to a small lead, Mitchell went down with an injury and for Shula to collect the record-breaking 325th career win, Miami was going to have to hold on with Doug Pederson, who had never thrown a NFL pass, at quarterback. Pederson finished the day just 3-for-6 passing, but the Dolphins were able to do just enough offensively while the defense pitched a second half shutout. Stoyanovich's second field goal of the day padded the lead to 19-14 and the defense did the rest. Defensive end Jeff Cross recorded three sacks while fellow end Marco Coleman added one of his own. The Dolphins' 19-14 victory put Miami at 7-2 for the season and Halas' NFL record of 324 wins was no more. The Miami Dolphins would win their next two games, but would drop their final five to finish 9-7 in 1993 and narrowly miss the playoffs. That day in mid-November however, belonged to Shula. The man who had delivered the Miami Dolphins their only two world championships stood alone as the NFL's all-time wins leader. Shula would be carried off the field by his players and claims today that was only one of two instances in which Shula was ever carried by his team with the other following Miami's 14-7 victory over the Washington Redskins in Super Bowl VII more than 20 years earlier. 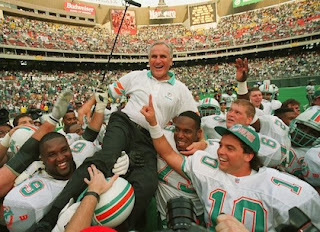 Shula would coach the Dolphins to the AFC East title in 1994 and a playoff berth in 1995 before resigning following a 37-22 playoff loss to Buffalo. Shula would finish his career with 347 wins, 23 more than Halas, with 288 coming as the head man of Miami. Shula had always been regarded as a man of integrity and remains a popular figure in South Florida today. While it may seem hard to believe for many, it was 20 years ago today that Don Shula first stood alone as the winningest coach in NFL history.